Armand Louis Guyot was a child prodigy when it came to dance, and it was pretty clear to everyone that he was headed for a career on the stage. 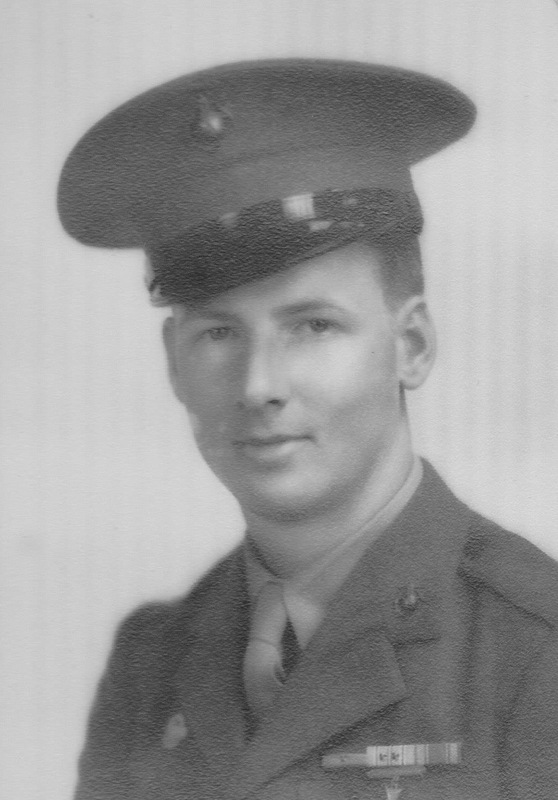 However, the war got in the way, and Armand was given his draft notice – he joined the Marine Corps on July 12, 1943, his eighteenth birthday. As Private First Class Armand Guyot (908331), he served as a rifleman with Company A, 24th Marines, in the battle of Saipan. Although Armand made it through unhurt, many of his comrades weren’t so lucky. The Fourth Marine Division took so many casualties they had to borrow replacements designated for the Second Marine Division. One of these replacements was eighteen-year-old Private Roland K. Jennings, an artillerist who was quite contentedly on his way to the cannons of the 10th Marines. He was not at all enthusiastic about being re-routed to a battered infantry company in the middle of a campaign, but his attitude changed when he met his new foxhole buddy – the former dancer from Chicago. Roland Jennings. Photo courtesy of his daughter, Phyllis Fleming. I first met Armand on Jig+2, 26 July 1944, when the members of the 58th Replacement Battalion went ashore on Tinian. Myself and 3 other privates were assigned to A Company, 24th Marines Regiment. We were transplanted cannoneers schooled in the art of field artillery suddenly becoming infantrymen. I was paired off with Armand, a combat veteran of Saipan, to learn the way of war. He was my mentor for 6 days until his untimely death on Jig+7, 31 July 1944. We shared the same foxhole, newly dug each night through the coal-mud surface. This covered a 5-day span. We quickly became close friends even though our backgrounds were completely opposite, he being raised in Chicago and I was the son of a Missouri farmer. …I can see your eyebrow raising already. I suppose this is a moot point but the Corps made a mistake on the KIA date. Armand, and one other Marine that I did not know, were selected as point men for our platoon as the Company made its way south on Tinian. They were killed by small arms fire from Japanese soldiers concealed in the underbrush just ahead of our troops. Everyone on the skirmish line was in mortal danger at this time, the 2 point men were our buffer. This occurrence turned into a full-fledged firefight for the remainder of the afternoon. The platoon finally dug in for the night when things quieted down. The following day, Jig+8, 1 Aug. 1944, the body recovery team secured our 2 comrades killed during yesterday’s clash. My last remembrance of Armand was rather disturbing. Both Marines had been placed on canvas litters and loaded aboard a small utility trailer drawn by a jeep. The bodies were covered by ponchos which served as a shroud. The only thing visible was their combat boots protruding from the cover. Their final destination was across the narrow channel to Saipan for interment in the newly established 4th Marine Division cemetery. After the war, Armand was buried in Rosehill Cemetery and Mausoleum in Chicago. The following pictures are courtesy of John Leng. Armand’s recruit platoon at San Diego.